Many of the world’s most stunning beaches rest on the border of great cities. These beaches are often hubs of a city’s entertainment and culture, offering a vibrant collection of bustling activity, culinary treats, and stunning landscapes. To ensure your metropolitan travels are a success, Flight Network had created a list of the 50 best city beaches in the world. 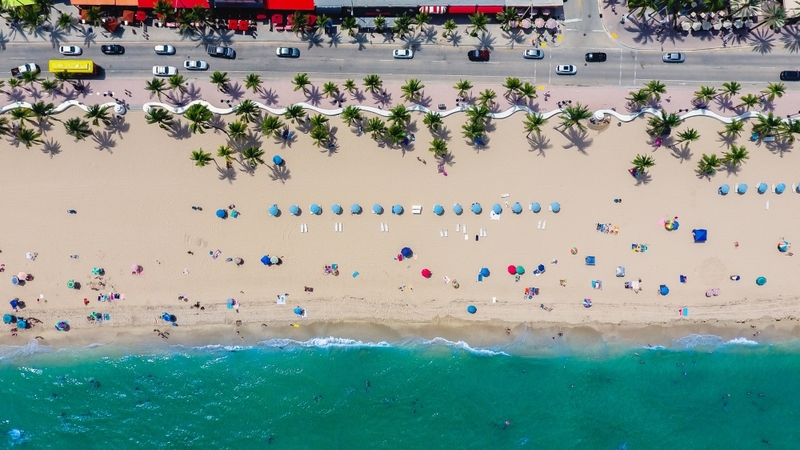 To create the world’s Top 50 City Beaches list, they received guidance from over 1200 travel journalists, editors, bloggers and agencies from around the world. These international travel experts helped to make this list an essential resource for anyone who likes to mix their sun and sand with city thrills. Let their comprehensive list of city beaches introduce you to the spirit of Australian surf culture at Bondi Beach, the colorful ambiance and clear waters of Miami Beach, the legendary shores of Brazil’s Copacabana Beach, and 47 other can’t-miss city beaches. From Morocco, Italy, and Spain, to the United States, Ecuador, and Brazil, this list has something for everyone. What was once a humble fishing village on the western coast is now one of the most vibrant beaches in all of Bali. With great surf, soft sand, incredible resorts and restaurants within walking distance, it’s no wonder why everyone who visits this Indonesian island wants to spend time here. Even though this beach is one of Bali’s most popular, it still oozes with charm. It’s also nicknamed ‘Sunset Beach’ for its epic evening views that keep travelers enthralled and dreaming of return. This beach will stay with you long after your visit. Many have called this the most beautiful bay in the world, and we’re not surprised. The bright turquoise water against the golden sand is only a portion of what makes this spot so special. This 7-km coastal beauty is replete with lush green landscapes, fantastic shopping, local eateries and nearby islands that are accessible by boat. Go for a dip inside the roped off swimming area, safe from boat traffic and jet skis. Take in the rich culture and good vibes and feel the grandeur of Nha Trang. The magical Karon Beach is the 3rd longest on Phuket Island, nestled on the west coast, between Patong to the north and Kata to the south. The beach boasts crystal clear waters, warm white sand and stunning sunsets. Grab a lounge chair, stroll along the clean shoreline or kick your feet up and find a shaded area to relax. Enjoy the serene beauty of the surrounding area and don’t forget to check out the fantastic water sports available along the beach. Karon Beach has a ton to offer during the day and night. Try some delicious local treats, visit the local watering hole or dance the night away. This magical getaway is Singapore’s coolest beach destination. Siloso Beach is frequented by locals and tourists thanks to its spotless facilities, clear water and activities like kayaking or skimboarding. The waves may be calm, but you can still surf the man-made waves. Look out at the gorgeous azure water and the lush palm trees and you’ll forget that you’re right in the heart of the city. The soft golden sand is an Australian import and is kept exceptionally clean. There’s nothing but the clearest blue displayed in front of you once your feet have touched the soft texture of white sand in Tanjung Aan, one of the secluded beaches in Mandalika, West Nusa Tenggara. Perfectly shaped like a crescent moon, Tanjung Aan Beach offers you a spectacular sight: an enormous horseshoe bay with two sweeping arcs of fine sand with the ends punctuated by waves crashing on the rocks. It has long been a prime tourist destination on the island of Lombok. Dip your feet into the water and let the beauty of Tanjung Aan Beach comfort your whole body with its tropical sensation. Patong is the most popular beach on Phuket, attracting thousands of local and international visitors looking to indulge in beautiful vistas, chill vibes and an active nightlife. This 2.5 km strip of beauty is bustling with hundreds of restaurants, bars, shopping, nightclubs and amazing local eats. There’s no end to the opportunities that Patong beach offers. But visitors don’t only come for the vibrant nightlife. The soft-sanded cove itself is absolutely beautiful. If you look closely, natural treasures and less trodden spots are not far from your fingertips. Prepare to be enchanted by the picturesque landscape of Quy Nhon beach. Gaze out at the lush green hills surrounding this humble, yet mighty, golden sand beach. This is one of the few beaches that remains untarnished by the tourism industry. You won’t find many tourists here. Just locals coming out at sunrise or sunset for a stroll or a game of soccer. The breathtaking vista is absolutely striking. And the nearby temples and museums give this untouched hidden gem an even bigger draw.